Before we go any further, let’s differentiate the two first. An infant car seat is a dedicated seat that’s ONLY rear-facing. It’s meant for newborns, up until they weigh at least 30 lbs (on most models). Others, though, are extended rear-facing car seats with a weight limit of 40 to 45 lbs. A convertible car seat, on the other hand, can start from either rear-facing or forward-facing. It can switch from one mode to another when the time is right, hence the term ‘convertible.’ Some are called 3-in-1s while others are also known as all-in-ones. The following seating options are available in convertible car seats. However, not all models may have all of these options. Some can be switched from rear-facing to forward-facing only. Others can be turned from rear-facing to forward-facing, to booster seats. Laws dictate that newborns are best kept in rear-facing mode from birth until they’re at least two years old. Do note, that this will also depend on the height and weight limit of the car seat. This is the safest way for your little rider to be seated. Although convertible car seats are bigger than dedicated infant car seats, they usually come with foam inserts. This is to make sure that your baby fits snugly in the car seat. As much as possible, let him stay rear-facing for as long as possible. When your child turns two or when he’s already met the height/weight requirement of the rear-facing seat, it’s time to switch to forward-facing. He should be okay in forward-facing mode until he’s at least four years old. Again, the height and weight limit in forward-facing mode are essential considerations. Also, be sure to use the harness when the seat is installed in your car. This is the final stage your child will have to undergo before he’s finally ready for your car’s seat belt. Typically, your ‘little adult’ should no longer need a car seat when he’s at least eight to twelve years old. You have to make sure that the car’s seat belt naturally falls on his shoulders before you decide to remove the car seat. Booster seats come in two variations. Booster seats are used to lift your child’s height so the seat belt can fit on him properly. In simpler terms, high back boosters are seats with ‘backs’ that sit on top of the seat in your car. Let me make it clear to all parents out there. A convertible car seat is just as safe as an infant car seat. After all, these car seats will not be out on the market if they failed safety standards and testings. The reason why you may or may not prefer a convertible car seat depends on a few factors. I assure you, safety is not one of them. To help you out, here are the pros and cons of getting this type of car seat. No need to purchase an infant car seat especially in the case of a rear-facing convertible car seat. Maybe more expensive but saves you a lot in the long run as it’s the only car seat you’ll ever use. You need to purchase a separate booster seat if the model you have doesn’t offer the option. 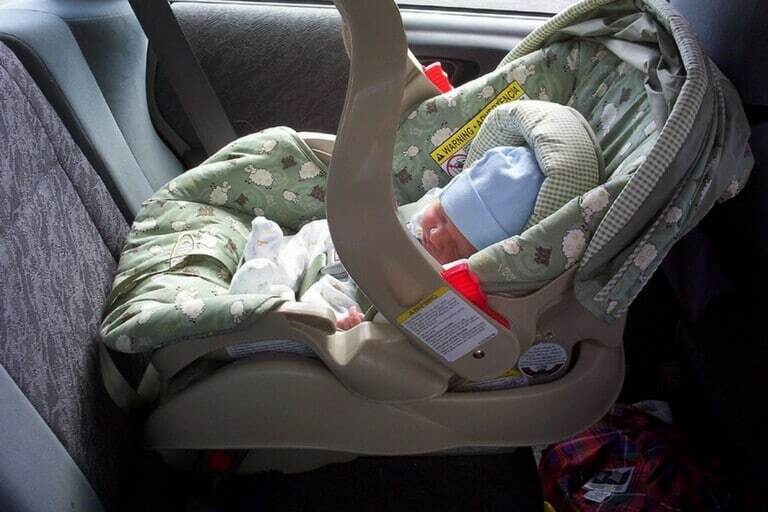 A convertible car seat installs directly to a car versus to a base with an infant car seat. This means that you’d be waking up your precious angel each time you need to take him in or out of the car. And like any other type of car seat, there also things or features that you have to look for in a convertible. Do note, that not everything here is precisely for this type of car seat only. In fact, these considerations are more or less the same regardless if you’re looking for an infant car seat, a convertible, or a booster. The National Highway Transportation Safety Administration (NHTSA) has made a very reliable list of car seats on their website. This list includes ratings as far as installation and overall ease of use are concerned. The more stars a car seat has means, the easier it is to use. NEVER settle for a convertible car seat that doesn’t have this type of harness. The good news is that most of them come with it. In the unlikely event that you come across a seat with a 3-point harness, find something else. Although a 5-point harness is a lot safer compared to a 3-point, it still depends on how you use it. Improper use of the harness exposes your child to risks in case an accident happens. The safest convertible car seat is one that’s used correctly. A good convertible car seat should come with covers that aren’t only removable, but washable as well. You’d be using this seat for a very long time. That means it will go through a lot of dirt, stains, and every other mess that you can think of. Having an easy-to-clean car seat means you have one less problem to deal with as a parent. A car seat needs to be comfy and snug while your little one is in it. Almost all convertible car seats are well-padded but pay attention to foam inserts too. I mentioned that this type of seat is typically bigger which can be a challenge for smaller babies. There should also be plenty of head support to ensure your child’s smooth ride. A convertible car seat, or any other car seat, will only be rendered useless if it doesn’t fit your vehicle. You can have the best convertible car seat packed with a lot of features. But the question is, will it fit your small car? Admittedly, there’s probably only a few convertible car seats out there that are made for smaller vehicles. This is because they’re made to change from one mode to another. The large profile is designed to accommodate kids of different ages. This car seat truly stands by its name — forever. Graco assures that this will be the only car seat that you’ll ever need. And why not? It starts from rear-facing, converts to a forward-facing seat, and finally to a booster seat. The bonus? In booster mode, it can turn from a high-back booster to a backless booster. Another thing to love about this car seat is Graco’s exclusive InRight latch attachment. This feature provides an easy, one-second attachment with an audible click to ensure secure installation. The NextFit is designed to be used in rear-facing mode (5-40 lbs) and turns to forward-facing (22-65 lbs). One issue that most rear-facing car seats have is getting the correct recline angle. It’s difficult because of the way they’re positioned in the backseat of a vehicle. Installation can even be more difficult if you have limited space like that of a small car. Well, worry no more! The NextFit comes with nine different recline options. Not only does it help in getting the right angle every time, it also ensures that your little passenger is always comfortable. The Pria 70 is also a 2-in-1 convertible car seat. This car seat is famous for its advanced safety features paired with premium materials. For protection, it has Flextech for multi-directional crash energy management and Air Protect for advanced side impact protection. It also features self-wicking fabric that deodorizes and draws liquids away from your child’s skin. Overall, it’s an excellent car seat that’s made for safety and comfort. A convertible car seat is an excellent choice for parents looking to save money. It’s also a great way to, at least, help lessen wastes from old/expired car seats. Instead of having multiple car seats which might just end up in landfills, you can have only one car seat for your child. Next article What To Do With Old Car Seats?